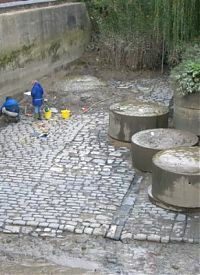 Members of the Foreshore Recording & Observation Group spent the first week of November 2009 surveying the old drawdock at Carrara Wharf in Fulham. The dock, which is adjacent to site of the original Putney Bridge is now used as a nature reserve and is usually kept flooded. The custodian Rick Davis drained the dock so that a survey of it’s archaeological features could take place. Day 1 involved clearing away the substantial silt deposits that had accumulated on the docks’ stone floor, along with gravel and other debris. On Day 2 we set up baselines and began planning the masonry and timber features. 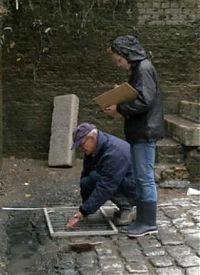 Chris and Deborah record the granite setts. Unfortunately the work had to be abandoned, and the site quickly evacuated, when an unusually high surge caused the dock to flood. A detailed risk assessment had already envisaged such an event, so there was no real danger, just a spectacular display of the might of the River Thames. The morning of Day 3 was spent clearing away the new silt deposited by the flood and re-establishing the baselines. We were joined by TDP Team Leader Nathalie Cohen who was given a guided tour of the site then put to work on an elevation of the site’s most important, and hitherto undiscovered, feature – details of which will be revealed at a later date. 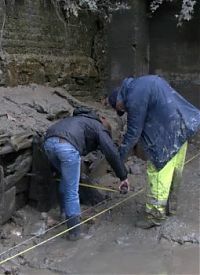 The final day involved more planning of the granite setts and timbers together with a survey of the dock walls and river defences. 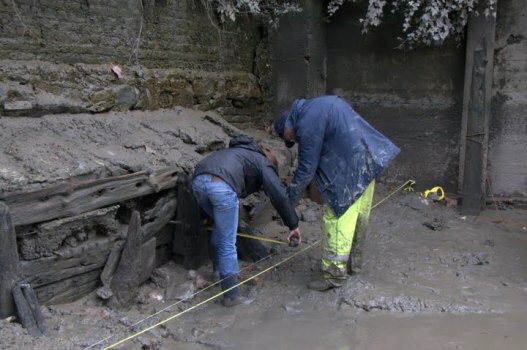 Given the sheer abundance of features within the dock, including one which ties the dock in with another site we surveyed in the summer, it was not possible to complete the survey. Rick has kindly agreed to let us work in the dock over the winter months before it is flooded permanently in the Spring of 2010. 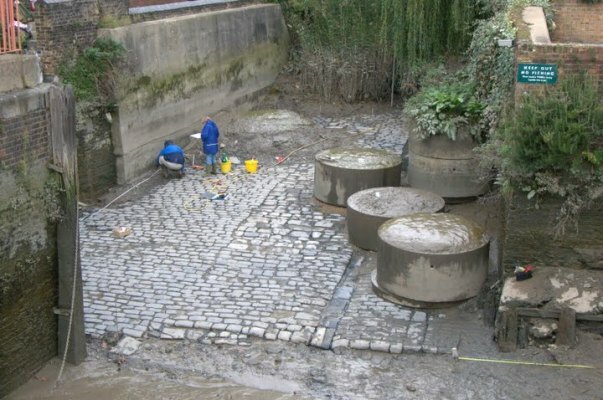 It is expected English Heritage will be visiting the drawdock with a view to placing it on the Sites and Monuments Record. The Carrara Wharf survey is the first project to be initiated and carried out by members of the FROG rather than the TDP team. Rain and floods aside it has been a great success. Any FROG member who wishes to get involved with the Carrara Wharf project should email the TDP Team.